Technology, you had me at hello. So Thursday after school I was tutoring a student in Algebra. We’ll call him Slater [cause it’s funny and I don’t use real kid names. It’s not internet-cool. I always try to be internet-cool]. His mom and siblings weren’t far away, but Dad was. He works overseas a lot. And Slater had actually just finished telling me that his dad has been to this city, that city, was now in Sweden, and would be going to Paris. And then France. 1. I know everything in the world. 2. I am always right. So post-argument, we returned to the quadratic formula, simplest radical form, and other things that I rarely admit to enjoying so completely. My thoughts: Yikes, I hope this doesn’t get really awkward really quick and then straight into This is the sweetest kid in the world to include me. Because he knows I like being right smack in the middle of everybody’s biz-nass. So Slater motions for me to follow him to the computer room while he gets instruction from Dad. A few clicks of a mouse and bada-bing: We’re looking at Dad on the computer screen while he is in Stockholm, Sweden (where it is 11pm). Because that totally fits in with what normal tutors do. Though it is freezing right now in Stockholm, Dad opens the window and turns to computer outside and pans the view so that we can see the lights of the city. He also shows us his SWEET suite- it seriously looked like Ikea threw up all over that place. I mean, seriously. 2 people in Georgia in the middle of the afternoon can see a live shot of the lights of Stockholm? Does that still amaze anyone else besides me, a dorky 4th grade teacher who still teaches about the European explorers who found America?? I remember being younger and watching The Jetsons on television. I always hoped life would be like that. Looks like we are getting there. 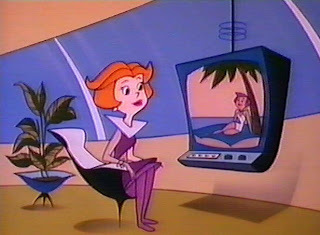 Personally, I hope the next Jetson-to-real-life item is the closet that dresses you each morning. I think if I had one, I wouldn’t be such a prime candidate for What Not To Wear. And if I had Rosie the robot housekeeper, I wouldn’t have to spend my Saturday afternoon cleaning my room. Sheesh.